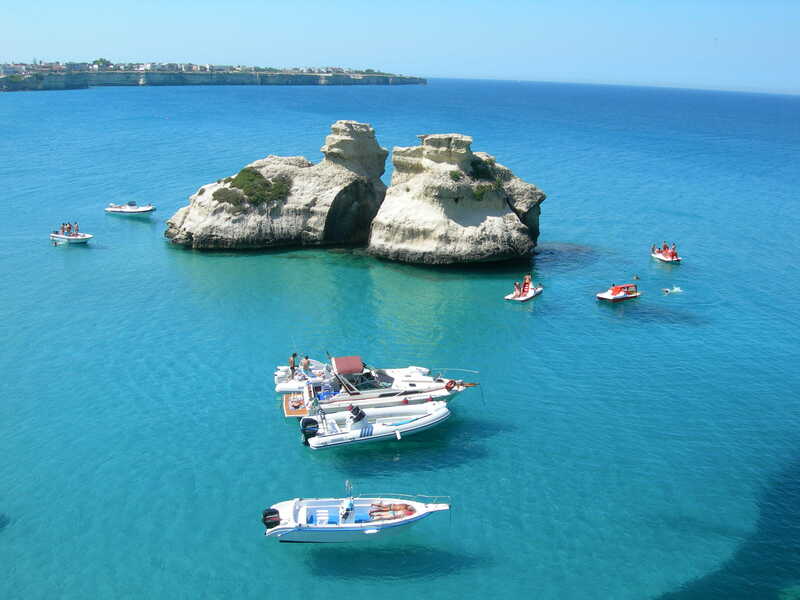 The Bay of Torre dell’Orso is one of the Marinas of Melendugno, on Salento’s Adriatic coast. It has been awarded the Blue Flag and Legambiente’s Five Sails designation for its cleanliness and crystal clear water. Sip a glass of wine or try a pasticciotto, the typical pastry from Lecce, on the terrace overlooking the bay of Torre dell’Orso … a unique experience! The bay of Torre dell’Orso is one of Italy’s most beautiful natural attractions. The half-moon-shaped beach stretches for some 900 metres, flanked by two cliffs, one of which affords views of the famous sea stacks called The Two Sisters. The Two Sisters – a beautiful backdrop. It is part of the Marinas of Melendugno, a long stretch of coast running from Torre Specchia Ruggieri, near the Le Cesine Nature Reserve, to Torre Sant’Andrea, where the beaches of Otranto start. There is something to suit everyone, large and small bays, mostly sandy, resorts with facilities and free natural beaches..
Free shuttle bus bus to and from the beach at Torre dell’Orso every 30 minutes – from 9 to 12:45 and from 3:30 to 6:45. Many beaches are free and include facilities. Special rates and discounts discounts at certain beaches at San Foca – Coiba beach and La Caciulara. For boat lovers, the Port of San Foca is just 5 km away.. The area before San Foca: crystal clear sea, ideal for fishing, diving, canoeing, pedalos, windsurfing, entertainment » San Basilio beach and la Caciulara beach. The coastal area of San Foca di Melendugno: a favourite with the locals, this beach is a long stretch of sand alternating with rocks. The marina, half way along, divides the shore into two parts, the beaches of Marangi (or Aranci) and Fontanelle. The sea is turquoise blue and the gently sloping sandy beach continues under water, making it ideal for swimming » Le fontanelle beach, Mamalù beach and Solero beach. 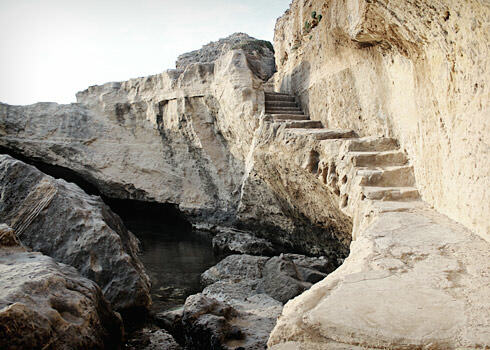 Grotto of Poetry – steps in the rock. Towards Roca Vecchia: small bays, sandy beaches surrounded by cliffs overlooking the sea (Coiba beach), and Roca Vecchia, with its pale rocky cliffs and white sand where umbrellas provide shade from the sun and the cliffs offer shelter from the wind. (KUM beach) Swimming in the natural pool of the Grotto of Poetry is a memorable experience. Bay of Torre dell’Orso – panoramic view. The bay of Torre dell’Orso » Costa d’Oriente beach, La Sorgente beach, L’Orsetta beach. To the south of Torre dell’Orso: rocky coast and deep water, ideal for underwater fishing. The Caletta di Torre Sant’Andrea: a break in the rocks and the water turns from green to deep blue. The numerous magnificent sea stacks have featured in many film sets and advertising campaigns.